Hello there supposed Nexus 5 making the news rounds early this morning. After the “accidentally” leaked shot earlier in the week, the news that a device dubbed the D820 has passed through the FCC is catching the attention of tech sites the world over. 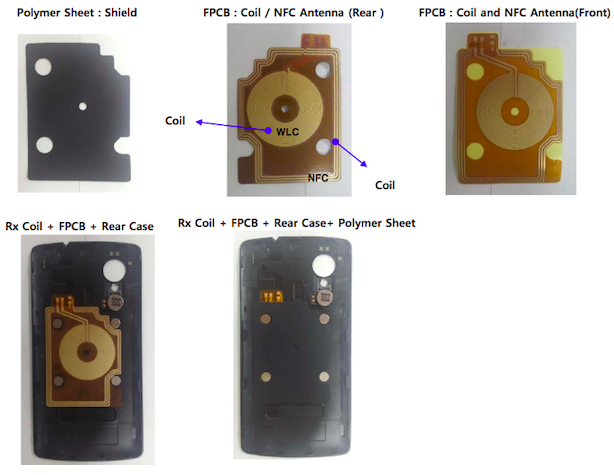 Now, we can’t jump to the conclusion that every device passing through the FCC in the next few weeks is the unicorn that is the next-gen Nexus, but a few pieces of material in the FCC docs has our attention. First and foremost is the image itself, with large-ish camera slot lining up quite nicely with the leaked image from the KitKat video. Then the D820 also features a glorious 7-band LTE radio compatible with AT&T, T-Mobile and Sprint. Add in pentaband HSPA+, quadband GSM, Bluetooth 4.0, NFC and you’ve got yourself a pretty capable workhorse. We know now that KeyLimePie was just a distraction to throw us off the scent of KitKat. Throw in a Snapdragon 800 as hinted at by the firmware and again, quite the capable workhorse. Add in some detective work from Brian Klug over at AnandTech and you’ll discover a 5″ display, well 4.96″ to be more specific. 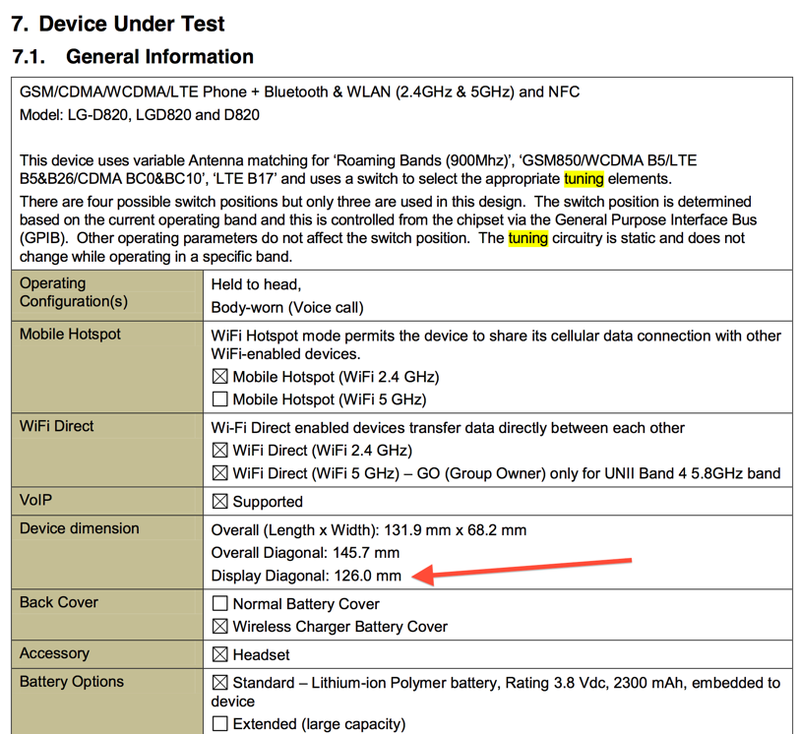 According to the FCC docs, the device measures 131.9mm tall and 68.2mm wide. So, what do we think? If this is the device as it appears in the KitKat announcement video, we could be in for one smartphone to rule them all. Let’s just hope the camera bests the Nexus 4 (which won’t be tough) and this device might be on the Christmas list of many Android fans. This will be a huge hit if the N5 is priced at the same level as the N4! Hope we don’t get disappointed on pricing (like we all were when the Moto X was finally announced). I love my N4, but now that T-Mo has LTE, I’m looking to upgrade to the N5 when it comes out. I flashed LTE on my Nexus 4 about 3 days ago….so far so good. Can you point to a detailed web site with step-by-step instructions? I have never flashed a phone, and I am hesitant to try. Also, how’s the N4 battery life with LTE? Just go on XDA, or look up LTE on nexus 4 on google, there are quite a few places where you can get the instructions for doing the flash! I am running Paranoid Android with Franco Kernel, and have the LTE mod on my Nexus 4 and usually get through a full day of use with my phone. Need the latest ADB and SuperSU to make it all work. (once my links get approved)… you don’t need need to install a custom rom. Just flash it with a HYBRID RADIO. I did the same thing to mine about 3 weeks ago. I have ran into a little bit of an issue thought. When I use the APN for LTE all of the pictures I upload to fb and google+ show up small and blurry. Have you run into anything like this? Hoping this pans out to be the Nexus 5. If so, my HTC One will be the secondary phone as I never owned a Nexus phone before. However, I might get the HTC Max when that comes out and take advantage of the Jump program. Come T-mobile. make it a proper tmo phone… I need wifi calling. Definitely. Wifi calling is a big feature that needs to be added there for TMUS customers. Also I hope theres a way to force different band usage. Its called a google nexus device not a tmobile nexus device. so seeing the tmobile wifi calling feature on the phone will never be unless google buys tmobile that’s sumthing kool but never happen. I’m aware of what its called. I’m just saying wifi calling would be a plus. Or, if they wanna keep i stock, they could at least add an app to the play store so people who want it can buy/get it. Its not in the appstore. Considering that the plans now are including unlimited calls, they should release their WiFi calling as an app. Before it deducted from your plan minutes to use the service. Just get the G2 it will virtually the same phone and most likely come with wifi calling. I am seriously considering doing that. I am not sure the cost difference will be worth it. True. But there still 3rd party sellers that offer subsidized phones. Wifi calling seems very important to this person. So it might be worth it. For me I miss wifi calling when I am at home. I have to force 2g just to make calls. This is the ONLY reason I won’t own a Nexus, I want expandable memory. A down arrow for my comment. I want to be able to hold more files than 16/32/64 Gigs onboard, and this is a common argument against the Nexus. It IS the only reason I don’t consider Nexus phones. When they start to incorperate this feature, I’ll likly get one! Othereise, it’s a fantastic device. Everything you probably hold on your phone, music/games/pics/videos/pdfs, I prefer to hold on my N7.1 32GB. I hold just a few small time-killer games on my phone and about 5GB of other apps and music. You pose some valid input, but I have a 32 Gig card in myNote 2. I have almost maxed it out at one point, had to go and delete some videos. I don’t have a tablet, don’t have plans to own one as I already have 3 computers, and I don’t want to lug two devices to the gym when my phone works perfectly fine for what I need. I also put movies and TV shows in my phone, and these take up a lot of space sometimes. I, personally, would prefer to have the ability to expand the memory past what the maker has offered. You do offer a possible solution. I survive with my phone alone at the gym, but the cloud and pandora are the reasons, besides the little I keep on my phone. One of the reasons why I’m keeping my T-mobile LG G2 pre order. Tired of batteries that I have to charge during lunch. Wow, that’s a lot of use! My N7 gets the bulk of my use, unless it happens to die. Even when I don’t have my N7, I go a whole day on my Gnex’s 1750mah battery, and that’s without the benefits of an energy efficient processor. We never really know until the phone is out how battery life is. Each phone is different on how it uses power. Additionally, KLP/KK it supposed to be otimized for lower power devices. I would bet that goes hand in hand with less power utilization. Don’t be too upset yet, this could be plenty for a full day’s usage. They can keep it. Android has reached it’s maturity state so nothing really major will be added in future updates, at least not that I can think of so there’s really no point (Other than having Stock Android) to owning a Nexus device anymore. Wow Debby downer, I hope you don’t make software for anyone as you have very limited views. What OS is bringing new innovative ideas to the table according to you? LOL I’m interested in why you think I’m an iOS fan? Funny how you try to throw insults when you feel threatened. It’s not that serious and for the record, I’m posting this from my GS4. I actually am not bashing Android at all, I’m just being realistic and not overhyping myself or praising an OS. No I am not Loyal to any OS. I’m all for major advancements and don’t you think Google would have shown a major advancement at the last I/O if they had anything? This is Google we’re talking about. The people responsible for alot of major advancements in the mobile industry and possibly the leading innovators now. I never liked iOS actually. It was too basic, no customizations, it forced you to use Apple products, they have proprietary hardware so none of it is universal, no sd card slots, non-removable battery and it’s just not for me. It works for others but it’s just too many negatives in my opinion. Saying you’re not creative isn’t an insult. It’s not like I told you you were stupid/bigoted/ignorant, etc. Also, considering both of the GS4’s i’ve used , both AT&T and T-Mobile variants(one of which was from a factory reset) were slower and choppier than my year old, unrooted Nexus 4, I’d have to disagree that there’s no reason to buy a Nexus device any more. There’s plenty of reason to buy one, considering it’s lasted at least twice as long as any other Android phone I’ve owned. Four HTC G2s in a little over a year, A Cliq which started having trouble three months after I purchased it, an Amaze which stopped reading SIM cards without warning after six months….Versus a single Nexus 4 handset in a year. Depends on how you use it and you were obviously using it in an offensive way. Actually Ignorant is not an insult. It just means you aren’t well versed in a particular area of study is all. Anyway, let’s move past that small stuff. G2 is known for problems despite it being a pretty good qwerty device. Let’s not even start on the Cliq lol, and yea the Amaze wasn’t so amazing either. I’m sure the GS4 has it’s share of issues as well. I haven’t run into any of them but I also haven’t modded or installed any custom roms onto mine yet though. Glad your Nexus 4 is lasting you. I know how it is to deal with disfunctional devices. It seems as if you’re having a bunch of issues from Android OEM’s other than Google. Similar to how I was having issues on my HD2 from Windows Mobile that I am SOOOO glad that I don’t have any more. I went through 11 of those devices (due to both Hardware And Software issues) because Tmobile wouldn’t exchange it for another device. Ok Durability is one reason yet some (Like me that have considered buying a Nexus 4) couldn’t get one due to Google forcing the use of the Cloud on the consumers, (which wouldn’t be such a big deal if it weren’t for the need to keep paying for storage space and the issue of having to download the content from the cloud (which eats up your data) considering that you’re in a good enough area to even get a decent signal to do so. I’d much rather have an SD card slot on my device so I can just pay one time for storage that I own rather than renting storage from a place that can be hacked and down at times from server based issues. I loved my G2 while I had it but when it came time to replace the fourth one, I was presented with the option of replacing it again or getting an Amaze. As this was pretty early in its life cycle, I ended up taking that option. It still serves as a temperamental MP3 player, but hasn’t read SIM cards in almost a year. I went from it to the One S which I was wildly disappointed with, and exchanged that for a Nexus. Removable storage is one thing every one of my previous devices had, but since I just carry something else with me for music, I get by. A friend wanted to use my Nexus for a few days, which is how I ended up using his GS4…which was a very disappointing device, given the guts it had in it. There’s no reason a Snapdragon 600 should perform worse in basic UI motions than an S4 Pro… But that was the case. I blame that more on Samsung’s heavy handedness than the Hardware, because the current One is a pretty nice piece of tech. Either way, I’m quite excited for the next Nexus, even though I probably won’t be getting one due to financial reasons. Completely understandable. If you have an alternate means of transporting your files such as a portable hard drive or alternate device then yea that’s fine then. I just don’t want the cloud to be the only option which is why I couldn’t get the nexus. I liked everything else about it including the price. I agree about the next Nexus as well. Glad the Nexus is working for you. Having malfunctioning devices is not cool. But on topic though, I would love to see advancements in the mobile industry though. But I just believe for any new major advancements to happen in the mobile industry, it’s going to take a renewal in the way that we use our devices. I would like to see the size of the average device top out soon, and a focus on battery life becoming the selling point. I have no problem charging a device nightly… I do have a problem with being able to kill a phone on a slow 6 hour shift at work though. I agree 100% with that. These 5.2+ inch “Phones” so to speak, are becoming ridiculously large and makes it hard to hold in the hand comfortably (insert “That’s what she said” joke here lol). Battery Tech should be a major focus now. It makes no sense to have a feature to contact your best friend on Venus if the phone doesn’t stay charged long enough to use it. Unbreakable and Flexible screens should also be another major focus. It makes no sense to have all these features and you can’t use them because your screen broke. The good thing is, both of these focuses are being addressed now, one is with Motorola and the Razr Maxx series. The 48 hour battery life of the new one is great. And screen tech is being addressed as well by a number of companies, one being Corning with their Gorilla Glass tech which hopefully Gorilla Glass 3 will be able to take a drop onto concrete from 5-6 feet up, and another being the Rhino Shield Kickstarter. I ordered it and it works GREAT. Hopefully these companies continue to work on this technology and get it as close to perfect as possible. I do miss one aspect of my Amaze, which was a removable battery. That phone basically needed it though… I also like what Moto did with the RAZR, but not being a Verizon customer, I was pretty much SOL when it came to that. True, Removable batteries are necessary for some devices. I prefer to have it removable though just in case the phone freezes or crashes, I can just take the battery out. Good thing though is that other companies are starting to improve their battery tech as well. Not as much as Moto but they are finally improving it. So hopefully this is a trend that will continue until alternate methods of powering devices emerge. None at the moment and that’s exactly my point. Thing is, most major advancements have already been made. Unless you think of holographic images, only thing needed now really is hardware such as unbreakable or flexible glass which is being worked on (Gorilla glass is breakable so that does not count) and advancements in battery tech. I’d love to hear a new major innovation that you can think of tha would be a game changer in the mobile industry now. Not being offensive to you in any way, I’d love to hear of a new advancement that you, or anyone else for that matter, could think of that could change the mobile industry. I’m not a developer or engineer so I am not so polished. Holographic is a good idea, but I would prefer better hands free use of the device and I don’t mean just Google Now or eye tracking, but a complete package that you NEVER have to touch the phone. Hardware/software that can greatly improve is camera. A lot of things can be improved upon in the current OSes. Groundbreaking? I can’t think of anything, and no one has been groundbreaking since Google Now/Siri releases. Exactly. Nothing really groundbreaking has come, not saying it can’t but I just don’t really see what else can be added on the software side to greatly improve the experience. Now I am LOVING the new MIMO antenna as they GREATLY improve the signal strength. Yeah Holographic imagery would be nice and since they actually do have that capability now at least in general (Not on mobile devices yet) it could be possible one day. The only thing is, Holographic imagery uses quite a bit of power to produce so in doing so, the battery tech will have to improve greatly to maintain it for long periods of time. And they actually do have it to where you never have to touch the phone. The new Moto X has the function to where all you have to do is speak to it to wake it, activate functions etc. I think we were talking native Android OS. :) Moto may be a Google company, but it’s still not Vanilla Android. Also, i don’t think Google Now does everything you csn physically. Power up a third party app and use it? Maybe I’m dreaming. I like your points, and I’m looking towards the future for all that ASAP. So, since YOU can’t think of anything that is worth adding, no one can. Gotcha. Everyone abandon Android because Wilma apparently Google is no longer consulting Wilma on how to design their OS. Funny you say everyone abandon Android as if your word is finite. Also, I’m posting this on my GS4 so I’m using Android. Fancy that huh? I’d love to see major advancements in the mobile industry, but at the moment, there are no major advancements that can change the game in the mobile industry. Why do you think Google’s last I/O had No major innovations and rather focused on fine tuning the OS? If anybody could have included major advancements, it would have been Google. Oh wait, you must have been one of those people that were pissed off about Google’s last I/O because they didn’t show the Nexus device and rather focused on Developers and Tweaking the OS. Makes sense now. Just because tweaking the OS doesn’t seem like a major advancement, doesn’t mean it’s not necessary. Fine tuning the OS as you said is essential to a fluid android experience. I rather take OS tweaks over half-baked “major” advances any day. A good example is your GS4. Samsung had pretty good ideas, however it bloated TouchWiz and made it laggy. If they focused on less features I think it would have been a better experience. I think they tried to hard to make those “major” advancements that you mentioned. You make it seem as if I said tweaking the OS was a bad thing? It’s a good thing that they are focusing on improving the OS. So, it says it has CDMA – would this hypothetically work on Verizon? It only has LTE bands for Sprint, T-Mobile, and AT&T. No Verizon LTE. It could work on Verizon for voice, but no LTE, so probably only for roaming. It “appears” not to have Verzion bands. Additionally, you can’t make Verizon and sprint allow you to use it. On AT&T and T-Mobile you just pop in the sim. Sprint and Verizon have to activate the phone for you. afaik Big Red is currently building their AWS LTE network so it could be available for them at a later date. No, it doesn’t support LTE band 13. I hope this really is a Nexus 5. And I hope it comes with a bigger storage like 32/64 GB and removable battery and a 13MP camera and of course 4G LTE. No removable battery according to the docs, but I’ll be shocked if you don’t get a 32GB option. 64GB is probably unlikely. I think I could live with 16GB indefinitely, as long as I have my 32GB N7 or unlimited data. It’s 5 inch display.. Why is it using 2300mAh instead of 3000mAh like the G2. It’s Google, they could take some ideas from Moto and play around with the software to boost battery life. Fingers crossed. Hopefully cuz my Nexus 4 is lasting less than a day with Wi-Fi and off. Hmm seems you’re doing something wrong. Try downloading Battery Guru. Or else factory reset because I’m making the whole day as long as I’m not on Candy Crush. errr…I hacked LTE on my nexus, I have that on all day, watch an hour long video podcast, listen to spotify, surf the web, text and make calls from 7am to 11pm when I go to bed and I usually have 10-20 percent of the battery left over. I didn’t add any kernel or rom or anything. Its all stock except for the LTE. even before I hacked on lte my nexus 4 lasted that long. Also try the Easy Battery saver app. But seriously unless you use your phone as part of your job I don’t how some people can surf, chat, play games, watch videos so much during the day . Don’t people got work to do? I was disappointing with only a 3950 mah in the new nexus 7, but it has an incredible battery life. I usually get 2-3 days with moderate use and I can easily get a full day of heavy use out of it. And that has a 7 inch 1080p display so I’m not too worried about it. Exactly, I have the new Nexus 7 and the battery life is exceptional! Bluetooth, WiFi, playing music, games, and all! Only a Nexus would be running a version “K” Android in JUNE (note the build date). Also, note the code name of “hammerhead”, which is a shark, just like the Nexus 4 “mako” (fans of the Mass Effect series should be familiar with those two types of sharks). This is a Nexus. Period. And Sprint CDMA support, too. That was… unexpected. It’s a very slight/subtle rounding, so probably why not noticeable. Nexus 5 you shall be mine. So is the screen and we know how that math works. Not always. There’s too little to go on at this point, though. True, but with the bump in the screen size and processor, not to mention the LTE radios, unless they figured out what wizardry Moto does with their batteries, I’m leaning to this having very similar battery life to the N4. Sharp Nexus, Fujitsu Nexus, Sony Nexus, Kyocera Nexus…………………but LG? ah come on not this again!! It’s better than another Samsung Nexus. What are you taking about? The Galaxy Nexus was a wonderful phone. Don’t get me wrong, I enjoyed my time with the Galaxy Nexus but it was nowhere near the quality of the Nexus 4. Ugh! LG? I was hoping for a Moto-Nexus. LG makes amazing phones. Just shut up, okay? They had a deal with Google for one more device. The next Nexus has the portential to be made by anyone. i’m more excited with the Nexus 5 than the Galaxy Note 3. dammit HTC, release the HTC One Max now before i spend my money on N5!!! If HTC releases the One Max with an SD slot I’m sold on it. Lmao he didn’t even try. Just release the phone and take my money damn it! the nexus 4 was the finest phone I ever owned but no wi-fi calling was a real problem. I sure hope the Nexus 5 has the ability to do wi fi calling! It’s a Nexus my friend, so don’t be disappointed as there will not be WiFi calling. There is no carrier bloats on any Nexus and that’s why they are Nexus. Tell that to the Verizon Galaxy Nexus, with all the bloatware on it. and that’s why Nexus 4 was never on any carrier. T-Mobile carries it but they have zero control over it. VZW ruined GNex and is probably why VZW is the only major carrier not LTE compatible with the Nexus 5. I never considered that to be a “real” Nexus device. The reason for poor PR that any Nexus has. More so the reason why any no other Nexus will be carrier exclusive again, plus why there is no Nexus 4 on Verizon. I was just correcting your comment. You stated, “There is no carrier bloats on any Nexus”, which is incorrect. There was one. Really. Why can’t Google just add this capability? Even Windows Phones have it at this point. Anyone know or guess what the size would be or is going to be on this bad boy? If you actually read the article, it states the screen size. No removable battery or expandable memory? Nexus 4 supports the 5ghz wifi band..
What percentage of the T-Mobile HSPA+ footprint is now covered by LTE? What about HSPA+ on the 1900 band? I don’t see HSPA+ mentioned in the image above… does the phone support it as well as the Nexus 4 did? Maybe time to grab a 4 while we still can. Of course, knowing the intended price of the 5 would also be useful in that decision. I checked the docs themselves and yes, it does support HSPA+ on the PCS band. One thing it doesn’t appear to have though is the ability to do simultaneous voice and data, probably due to technical limitations related to trying to fit all those bands and technologies in a single handset variant. It should, because there hasn’t been a smartphone with T-mobile that couldn’t do voice and data at the same time. I just jumped back to the Nexus 4 about 3 weeks ago after about 2 months of the HTC One as my daily driver, and the only thing that I really miss is the LTE so I’ll be impatiently waiting to get my hands on the Nexus 5! We just got LTE in my area two months ago, and now it’s difficult to settle for hspa+. I always felt that Tmo’s data speeds were adequate and had no overwhelming desire to be on LTE, but I couldn’t miss what I never had I guess? If it’s packing a good camera I’ll be pleasantly surprised as I’ve come to expect less then average image quality from the Nexus line and so long as it’s improved over the previous Nexus I won’t gripe over it. I always read comments regarding the disappointments ppl have over lack of SD card, poor camera, etc etc, but I’ve come to understand that Nexus is not about features or even hardware, it’s for those who are focused on Android software and not for anyone looking for a flashy or cutting edge device to show off. I’m a sucker for stock android and immediate updates, and I always have other devices I can go to for features. Damn. The Moto X for T-Mobile is on Motorola’s site for $599. Looks like I’ll be getting the next Nexus. That’s way too much $$$ for the Moto X.
I think if it has a great camera, affordable pricing, and great battery life, it shall be mine SOON! I know there probably won’t be, but please, God, let there be an SD Card slot. I’m a rooting, modding, vanilla android fanboy for life, but seriously.. need an sd slot. please. I know you’re reading this. just do it.